We get asked a lot about the option to have a buffet style service for many events. Objecting to buffets mainly on an aesthetic level, we have a more interesting take on the old buffet- to make it fresh, trendy and an addition to your event rather than an eyesore. Our solution = Food Stations. The individually themed stations, designed by our good friend Max of Clymax Designs, add an amazing element to events and really add to the theming of our already elaborate space! There are quite a few ways our clients incorporate the stations into their events, by selecting a food station package, or adding a food station (or three!) to your menu. We can incorporate these in a couple of ways – during guest arrival, main meals or our favourite, dessert!! The food station packages we offer are based on 3 or 4 savoury stations with one dessert station. Set up strategically around the space, guests have the freedom to roam between each station and return as many times as they like. By selecting different combinations with this package we can create a Hawkers style market, with multiple cuisines and produce available to your guests. 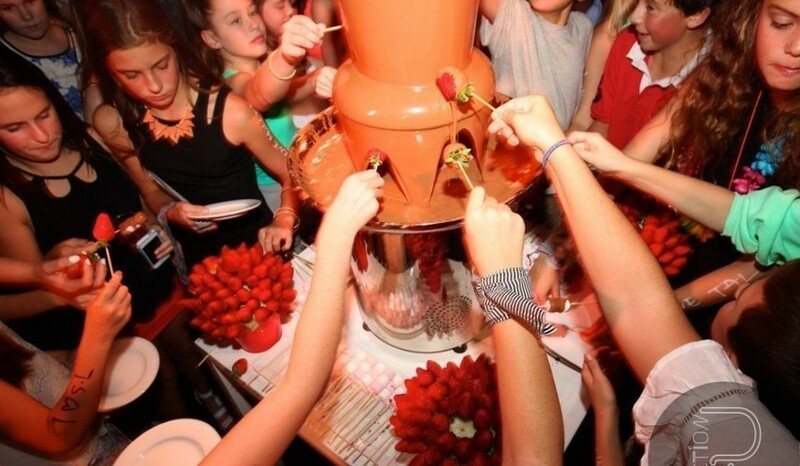 And if the floor plan allows, we always love the opportunity to reveal a Chocolate Fountain as a surprise element for the guests! These interactive self-serve stations are something out of Willy Wonka’s factory, with colours and lollies and flowing chocolate to indulge in. The Yum Cha station or the Peking Duck are a fabulous addition to arrival canapés, where guests meander up to the station at their own leisure to enjoy. The live preparation and serving of food behind each station is enticing and inviting, not to mention delicious! Or why not finish your event with a bang? Our personalised Candy Spot or Baker’s Market are the perfect ending of a fabulous event. Guests can help themselves to a colour coordinated array of lollies and sweets (bridesmaids colours anyone?) or add your dessert options to the station for a jam packed choice of treats. With 13 different stations to choose from, the possibilities are endless – click here to see the full list available!